This Challenge makes the point that we can make a choice to honor God even if difficult situations. Joseph was sold into slavery by his own brothers, but he was such a trustworthy slave, that Potiphar put him in charge of everything in the house. When Joseph was accused by Potiphar’s wife and thrown into prison, the prison warden soon put everything under Joseph’s authority, because Joseph was so faithful in how he handled his responsibilities. Participants will plant flowers in a mixture of gravel and water jelly crystals to show that you can still bloom when you are in a bad place. Item #: WSAC-900) Order early, because they may take up to two weeks to receive. It’s important that the crystals are clear and not colored. You can find these crystals at http://www.stevespanglerscience.com/product/1283. Divide the water jelly crystals evenly so that you have the same amount for each group, and place them in Ziplock bags. Add a scoop or large plastic spoon to each bag for scooping out crystals. Add enough plastic cups for each person in each group. Divide the gravel evenly among the groups, and put it into a bag or some other container for each group. Set aside enough flowers for each person in each group. Do you think the flower will bloom where you planted it? Why or why not? Why do you think Joseph was able to succeed in difficult situations? 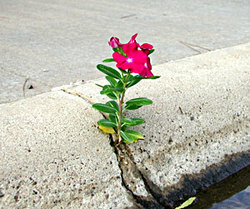 How could you “bloom” when you find yourself in a difficult place? A sheet of blank paper for every child. •	Unfold the paper, and write one of each of the following words in each of the three panes you have created on the paper: TOOL, TEST, TERRITORY. •	Fold the paper so that it makes a triangle with the three words on the outside. •	Tape the edge of the triangle so that it will maintain its shape. •	Distribute these to the kids when they arrive.